Our Driveway Signal Bells and Chimes are the old-time gas station driveway bells that made famous the familiar “ding…..ding” when you drove your car over the black rubber hose at the full-service gas station. Years ago all service stations had one just like it. 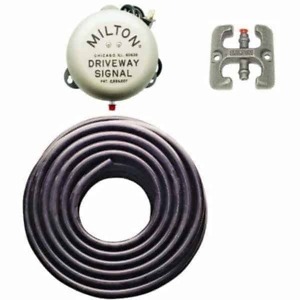 Our Safeguard Supply Milton Driveway Signal Chimes are the old-time gas station driveway bells that made famous the familiar “ding…..ding” when you drove your car over the black rubber hose at the full-service gas station. Years ago all service stations had one just like it. Just plug your Driveway Signal Bell into a standard electrical outlet, push the driveway hose onto the bottom of the bell, and push the end-of-hose anchor on the other end of the hose. You are now in business. This all-inclusive chime kit features a Service Station-grade thick-walled driveway hose. It’s able to withstand various factors such as oil, gasoline, dust, gravel, etc. Hose is not available for purchase in home improvement or hardware stores. Package includes (1) Driveway Signal Chime 802, (1) Heavy Hose Anchor 819 and (1) Driveway Signal Hose 50 feet 838-3350521. Works with 300 feet of signal hose. Reliable performance — alerts you without fail with that characteristic “ding ding” sound. Works with standard 110V outlet. Made of top-quality materials for extended product life and performance. The hose must be placed on asphalt or concrete driveways ONLY, can not be used on gravel driveways!